Starting on a ketogenic diet? Let’s calculate how much you should eat. 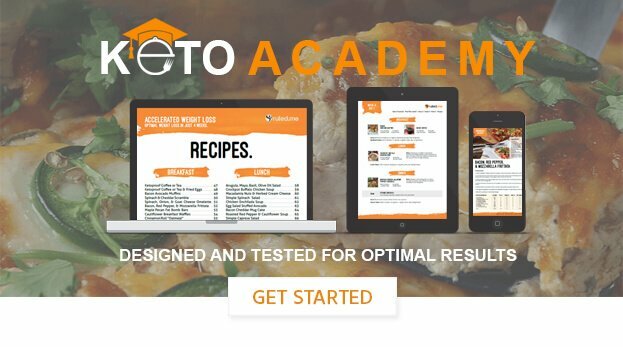 We use the information you put in to create an accurate keto nutrition profile for you. What is your height in centimeters? What is your current weight in kilograms? What is your height in feet? BMI and body fat are two different measurements. If you don't have calipers or a DEXA machine, use our guide to visually estimate body fat percentage. If you use a heart rate monitor and want to input a specific calorie expenditure. The number you input will replace our calculations entirely. Note: This is for advanced users only. It's recommended to never go above a 30% calorie deficit. It's also recommended that you never go above a 15% calorie surplus. If you do, negative results may happen. Protein shouldn't be over-consumed on a ketogenic diet. If too much is eaten, it could lead to slower weight loss and smaller levels on ketones in the blood. If you're sedentary, we suggest between 0.6g and 0.8g protein. If you're active, we suggest between 0.8g and 1.0g protein. Do not miss this special offer and opportunity to achieve your weight loss goal! How do I use your calculator to get my macros? While inputting your information, you may find that some of the sections and terms are confusing. If this is the case for you, simply click the lower case “i” logo located near the title of each section of our keto calculator. After you click the lower case “i” logo, you will be directed to a brief explanation that should answer your questions. If you are still unsure of how to use the keto calculator or if you think you aren’t getting the right keto macro numbers, read through the other Q&As and comments below, you will probably find the answer there. If you still don’t find the answer, please submit a comment with the question and we will address it as soon as possible. Why do you need my gender/age/height/weight? Most people aim for a specific goal on a ketogenic diet. We aim to make sure the results of the calculator are accurate and can be used by anyone. Our keto calculator uses the Mifflin-St.Jeor Formula which was the most accurate (versus the Katch-McCardle Formula or the Harris-Benedict Formula) in a few studies. In this formula, the gender, height, weight, and age are needed to calculate the number of calories to consume. Why do you need my body fat percentage? Our keto calculator uses body fat percentage to calculate your lean body mass. Using this number, we’re able to calculate how much protein you need to sufficiently lose weight without losing excess muscle. Eating too little or too much protein on a ketogenic diet (or any diet) can lead to dangerous or unwanted results. DEXA scans are proven to be the most accurate measurement of body fat. They’re commonly available at gyms and some doctor offices when requested. If you don’t have access to this, you can always go the old-fashioned route and use a good quality caliper. The last resort is using a guide to visually estimate – this can sometimes be a little bit inaccurate, so try to over estimate your body fat percentage. Why do you need to know my activity level? This will give us an idea of how much the minimum amount of calories your body will burn in a day. Our keto calculator uses this to calculate your Basal Metabolic Rate (BMR). We use this number, along with your body fat percentage, to estimate how many calories you’ll need for your goals. The BMR is simply a number of calories we burn while our bodies are at rest and from eating and digesting food. Together they form what’s known as TDEE, or total daily energy expenditure. This is the keto calculator’s estimate for your total calories burned per day. If you use a heart rate monitor or third party software to monitor your calories, you can use the custom input in the activity level section for an even more accurate macro profile. A deficit or surplus just relates to the number of calories you want to intake. A surplus means you are eating more than your body needs. A deficit means you are eating less than your body needs. Typically if you are losing weight, you want to have a deficit in calories. 10-20% is standard for people. 20-30% ranges are considered high deficits and are typically difficult to do (you will be fighting hunger). You can go up to a 30% deficit, but going past that can lead to metabolic damage in the long run (study). Typically if you want to gain muscle, you want to have a surplus in calories. You need extra calories if you want to put on lean mass. Typically, 5-10% is suggested, but going over 10% can lead to excess weight gain. Why should I eat so few carbs? There are numerous benefits that are scientifically proven on the ketogenic diet. On keto, it’s a general rule of thumb to stay under 30g net carbs a day. We recommend for weight loss to stay at or below 20g net carbs a day. The end goal of a ketogenic diet is to be in a metabolic state known as ketosis. We do this through starvation of carbohydrates. Protein intake is imperative when it comes to keto. Too much and you can lower your ketone levels, too little and you can lose excess muscle. You want to be in the sweet spot. If you’re sedentary, we recommend having between 0.6g and 0.8g protein per pound of lean body mass. If you’re active, we recommend having between 0.8g and 1.0g protein per pound of lean body mass. If you want to gain muscle, we recommend having between 1.0g and 1.2g protein per pound of lean body mass. You should not need to consume more protein than that, according to these studies. It can seem complicated, but it’s honestly not! It’s just a ratio of protein. If you are 100 lbs. of muscle and want to gain muscle (1.0g protein), you eat 100g protein. If you’re still confused, don’t worry – the keto calculator automatically sets your protein based on your activity level. I’m not sure about my macros, are they right? You should try to eat according to the macros given and try to spread your meals out during the day. Don’t worry about getting exact numbers to the tee. You can afford a small fluctuation in your macros, but as long as you are close to your ranges, it will balance itself out. Why do calories matter? Isn’t a keto macronutrient calculator useless if I am already limiting carbs? After hearing about the keto diet and how it helps you burn fat, you may be wondering why we even have a keto calculator. According to many low carb diet proponents, all that really matters when it comes to losing fat is cutting the carbs — Isn’t this true? High-quality research studies have been published on this specific topic, and the data clearly shows that – regardless if you are on a high carb or low carb diet — you will lose weight if you are in a calorie deficit and gain weight if you are in a calorie surplus. For a closer look at the research and why calories matter, check out this article. Due to the irrefutable importance of calorie consumption for weight loss and weight gain, a keto macro calculator is one of the most valuable tools that you can use to increase your chances of diet success. Do I have to use the keto macro calculator to get results? Simply by eating keto foods and cutting out the carbs, most people will eat fewer calories than usual and start losing weight consistently. However, following the diet in this way can increase your likelihood of hitting a weight loss plateau and not knowing what to do next. To help you stay on track to meeting your macro needs, we recommend using a calorie tracking app like MyFitnessPal or Cronometer. If you’d like to learn how to use these apps for the keto diet, read through our carb (and calorie) tracking guide. What exactly do the results mean? Let’s start with the calories. Simply put, a calorie is a basic unit of energy that helps us understand how much energy we can potentially get from the food we eat. Calorie intake is one of the most critical variables to be aware of when you are trying to change your body composition. If you eat fewer calories than you need to maintain your weight (which is also known as a calorie deficit) then you will lose weight. Conversely, eating more calories than you need to maintain your weight (which is also known as a calorie surplus) will cause you to gain weight. Notice that I am saying “weight” loss and “weight” gain rather than “fat” loss and gain. By manipulating your calorie consumption, you will predictably change the numbers on the scale, but whether or not those numbers reflect a strong bias toward fat loss depends on the other numbers from your keto macro calculator results. Fat, muscle, and water can all be lost and gained during the course of your diet. The proportion of weight you lose as fat, muscle, and water depends heavily upon the macronutrient content of your diet (i.e., how much fat, protein, and carbohydrates you eat). If you’d like to learn more about the macronutrients, check out our guide to macros. Depending on the info that you enter into our keto calculator, you will get different ratios of fat, protein, and carbs. In general, carbs should remain low because they will prevent you from entering into ketosis and getting all of the benefits of the keto diet. By limiting carb consumption to this degree, many people will lose a considerable amount of water weight as well. Protein is essential for maintaining and gaining muscle mass. Eating less protein than recommended by our keto calculator will typically cause you to lose more muscle mass while eating the right amount of protein will help you maintain or gain muscle mass (as long as you are doing some form of resistance training as well). While you are restricting carbs, your fat intake will be used as a lever to increase and decrease calorie consumption so that you can gain, maintain, or lose weight. If you are eating the right protein along with the right amount of calories and fat, then the percentage of the weight you lose from fat will increase. My protein is higher than my fat recommendation. What should I do? You didn’t convert grams to calories. You must convert the grams of fat and protein to calories and then calculate your macronutrient percentages. Calorie percentages, not gram percentages, are what the recommended keto percentages are based on. Usually, once you account for the fact that one gram of fat has five more calories than one gram of protein the calorie percentages will end up being what you expect from a typical keto diet. Your goals and activity levels require you to eat more protein. Even after you convert grams to calories, you may find that your suggested protein intake is high (above 30%) and fat is a bit low for keto (less than 60%). This commonly happens for keto dieters who lift weights and won’t impair your progress with the keto diet. The only problem that high protein intake can cause, however, is lower levels of ketone production. If this is the case for you and you want to maintain a higher level of ketosis, then try decreasing your protein intake to the lower end of the recommended range or restricting carbs a bit more. In general, as long as you are restricting carbs enough and eating the right amount of protein for your body composition goals and activity levels, you should be able to get all of the benefits of the keto diet — even if your macro percentages don’t fit precisely into the recommended keto percentages. Why does your keto calculator only calculate net carbs? Total carbs is not a precise indicator of the carb content of a food. When you see “total carbs” on a food label, the number beside it represents the cumulative total of grams of dietary fiber, sugar, and sugar alcohol that are in that food item or beverage. Net carb content, on the other hand, relates to the carb content of the food that is digested at four calories per gram and impacts your ketones levels. By giving you your suggested carb consumption in net carbs, we are providing you with the most direct way of knowing how many carbs you need to eat to enter ketosis. Any dietary fiber or sugar alcohol that is added on top of that will usually have a little to no direct effect on your ketone levels and body composition. For example, if we told you to eat 50 total carbs rather than 20-30 grams of net carbs, you could be eating anywhere between 0 and 50 grams of net carbs. At 0 grams of net carbs, most people will get into ketosis within the first week and experience deeper levels of ketosis as the weeks progress. On the other hand, while eating 50 grams of net carbs per day, many people will struggle to get into ketosis and sustain higher ketone levels. By following a strict net carb limit, you will know exactly what you need to eat to get into ketosis reliably and what variable you should change if you want to stimulate more ketone production. Does your calculator have a fiber intake option? Our keto calculator will only tell you your suggested carb, fat, and protein intake. The general recommendation for fiber intake is 14 grams per 1,000 calories consumed. The simplest way to meet your daily fiber needs are by eating more low carb vegetables, having some keto bread with your meals, or taking fiber supplements. If you find that your fiber needs are difficult to meet with your current net carb limit, then simply eat enough fiber so that you have regular bowel movements one or more times a day. What should I do after I use your keto macro calculator? Once you get an estimate for your keto macros with our keto calculator, we recommend checking out our keto guide, keto recipes, keto food list, and carb tracking guide. Click on this link to check out our keto recipe catalog (with new keto recipes added every week). This will give you a good idea of what you can eat for breakfast, lunch, dinner, and dessert while you are keto dieting. I also suggest checking out our keto food list so you have a better idea of what you should and shouldn’t eat. Once you know what you will be eating on keto, you will probably be wondering how much of you should eat for each meal. Since meal size depends on the individual and his/her goals, we recommend using a calorie tracking app and our carb tracking guide to help you figure out the macronutrient content of your meals. As you track your macros, you will be able to figure out what adjusts you need to make to your diet to reach your goals. How do I meet my macros with a ketogenic diet? To see more specific advice on how to meet your macros on keto, click here for a comprehensive keto food list. Or, if you want a different idea of how to get to these macro calculations, you can also see our 30 Day Keto Diet Plan for ideas. If you are looking for more specific suggestions on how to meet your protein and/or fat needs on keto, we will explore that in greater detail in the next two questions. How do I reach the protein intake level that was recommended? Most keto dieters will be able to meet their protein needs with 2-3 keto meals that contain one or more of these protein sources. If keto recipes aren’t enough to help you meet your protein needs, all you need to do is add one of the high protein foods from the list above. Add white meat chicken, turkey, or other lean meats or fish to your meal. Have egg whites with your meal. Make a quick protein shake with a low carb protein powder. Add higher fat meats like bacon, sausage, and fattier cuts of meat to your meals. Have whole eggs with your meal. Add extra high protein cheese (e.g., parmesan cheese, mozzarella cheese, cheddar cheese) to your meal. Have some high protein nuts and nut butters (e.g., almond butter, peanut butter). For more high protein and/or high fat keto meal ideas, check out our keto recipes. Dishes that feature seafood or meat will typically have the highest protein content. How do I eat all of the fat that the keto calculator recommends? When you are first starting the keto diet, eating so much fat may seem like a daunting task. How are you supposed to consume all of that fat and enjoy it at the same time? By knowing what keto-friendly options are available to you. To meet your macros most efficiently, try combining high protein with high-fat foods or have foods that are both high in protein and fat at every meal. For example, having a fatty fish or fatty cut of meat with high-protein cheese (and low carb vegetables) is a simple and easy way to have a keto-friendly meal that will help you meet your protein and fat needs. On the other hand, if you just want to increase your fat intake, then find ways to add oil, animal fats, butter, fat bombs, and/or high-fat cheeses to your meals or snacks. Add higher fat meats like bacon, pepperoni, and fattier cuts of meat to your meals. Have whole eggs or egg yolks with your meal. Top your meals with high fat, low protein dairy like mascarpone cheese, heavy cream based sauce, or cream cheese. Add sliced avocado to your meals or have it as a snack. Have fat bombs whenever you are running low on fat. Top off your meal with extra oil or animal fat. Have high-fat nuts like macadamia nuts, brazil nuts, and pecans. Add your favorite keto dressings when appropriate. For more high fat and/or high protein keto meal and snack ideas, check out our keto recipes. How do I track my net carbs? The simplest way to make sure you are limiting carbs enough is by using an app like Cronometer that calculates net carbs for you. In our guide to carb tracking on keto, we teach you how to configure Cronometer (and MyFitnessPal) for keto diet success. You can also track net carbs by calculating them yourself and adding them up throughout the day. If you need help finding the net carbs in the foods you are eating, read through this quick post.